Clive Weston died shortly after his 37th birthday, on 7 April 2006, having been diagnosed three and a half years earlier with a brain tumour. He had joined HCS as a day boy until his final year when he opted to board in the Old Deanery. 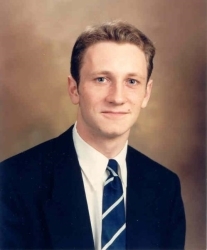 He became Deputy Head of School and received a number of academic prizes, as well as representing the school at both cricket and rugby. As an oboist he was an enthusiastic member of the school orchestra, but he was most at ease with the piano which he played with enormous gusto, entertaining his friends at many a party both during his school days and beyond. Clive read Classics at Pembroke College, Cambridge. Such was his strength of character that he refused to allow injuries caused by a mugging in his second year to overcome his determination to achieve, and he went on to graduate with a starred first class degree. CARW was called to the Bar by Middle Temple two years later, by which time he had been given a number of awards including an Astbury Scholarship and a Queen Mother Scholarship. He went on to have a successful career specialising in personal injury and professional negligence claims. His clerk’s appraisal of him was that he would have taken Silk before he was forty. In 1997, Clive married Rebecca Sabben-Clare, another barrister, in the Chapel of Winchester College where her father was Headmaster. They enjoyed nine years together and Rebecca’s love and courage were an immense support to Clive during his final illness. He also drew strength from his membership of St Peter’s Church, Hammersmith, where he sang in the choir and served on the Parochial Church Council. He relished the opportunity to become involved in the musical life of the church and to widen his already huge circle of friends. As in other areas of life, people were drawn to his warm and generous personality. It was noticeable that as Clive’s life moved towards its inevitable close his Christian faith deepened. He shared with his father an inter est in Apologetics and they regularly exchanged letters on this subject. His last birthday present to his father was a book entitled ‘The Twilight of Atheism’. In Clive’s memory, St Peter’s Church plans to organize an annual “Clive Weston Memorial Lecture” on an apologetic subject.